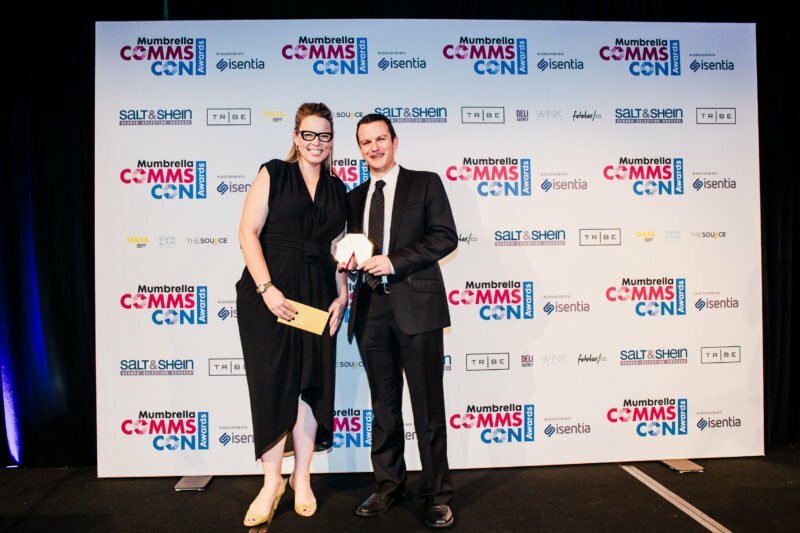 Red Agency has been named Large PR Agency of the Year for the second year running at Mumbrella’s CommsCon Awards, with the agency taking home three trophies on the night. The agency won Best Campaign with a Small Budget for its Christmas Crack Ups work for Camp Quality and also won Pro Bono Campaign of the Year for The Riderless Bike for The Steve Waugh Foundation. More than 400 people packed the Four Seasons Hotel in Sydney to see the fifth CommsCon Awards presentation which was hosted by comedian Tim Ross. Hunter Communications was named Boutique or Small PR Agency of the Year while History Will Be Kind won Midsize PR Agency of the Year. Klick Communications was named CommsCon’s Best PR Employer, while Access PR was highly commended. In the people categories, Ava Lawler was named PR Leader of the Year for the second year running. Edelman Australia’s Samantha Gale was named PR Professional of the Year – Agency while Woolworths’ Peter O’Sullivan won the same award in the inhouse category. Filtered Media’s Ghadeer El-Khub won Best PR Talent of the Year. Woolworths’ Alycia Bryant was named Social Media Community Manager of the Year while Cheepjokes Andrew Morrey won Influencer of the Year.